The 2009 Insight Bowl game will match-up the University of Minnesota Gophers with the Iowa State University Cyclones on New Year's Eve Day, December 31 in Phoenix, Arizona. The game is usually played annually at the end of December and features, since 2006, teams from the Big Ten and the Big 12. Before 2006 the Bowl has featured teams from the WAC, the Big 12, the Big East and Pac 10. The Cyclones represent Iowa State University in the North Division of the Big 12 Conference. Big 12's #3 Iowa is bowl eligible for the 1st time since 2005. The Cyclones will be making their 10th all-time bowl appearance after posting an incredible turnaround in 2009. For the 'Golden Gophers' the 2009 Bowl game marks the 9th bowl berth in the last 11 seasons, the program’s 14th overall post-season bowl appearance and its second in a row under third-year head coach Tim Brewster, falling to Texas Tech 44-41 in overtime in 2006 and to Kansas 42-21 in 2008. Started in 1989 the Bowl was formerly known as Copper Bowl (1989 - 1997) before it became the Insight.com Bowl (1997 - 2001) and later on in 2002 the Insight Bowl - the name it is known for today. One of the biggest games ever played in this college football bowl game was the 2006 game, when Texas Tech did something no one could have ever imagined. The team came back from a 38–7 third-quarter deficit to defeat Minnesota 44–41 in overtime. The current title sponsor is Insight Enterprises, which is a leading provider of brand-name information technology (“IT”) hardware, software and services to large enterprises, small- to medium-sized businesses and public sector institutions in North America, Europe, the Middle East, Africa and Asia-Pacific. Previous sponsors include Domino's Pizza (1989-1990) and Weiser Lock (1991-1995). 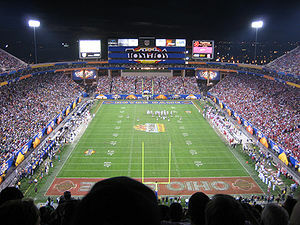 The game location for this college football bowl game is - since 2006 - the Sun Devil Stadium, an outdoor football stadium located on the campus of Arizona State University in Tempe, Arizona. The Arizona State Sun Devils, who play in the Pacific-10 Conference, call this stadium their home. When the stadium was built and opened in 1958 it had a seating capacity of 30,000 spectators. In the meantime, after several expansions, the seating capacity was expanded to over 73,000. Buy your Insight Bowl Tickets now before it is too late and be one of the tens of thousands enthusiastic fans in this great stadium. One a side note, the stadium also hosted 2 very famous individuals: In 1987 Pope John Paul II held a Mass for over 75,000 and in 2009 President Obama delivered the ASU commencement address in front of over 63,000 people.